A company well-known for canned and frozen vegetables recently announced America’s favorite vegetable is . . . drum roll, please . . . broccoli. Sorry, but I’m not buying it. And not just because they only polled 4,000 people. What I am buying is sweet corn—from roadside stands, the farmers’ market, and when they’re selling fresh local ears, even the supermarket. Just-picked sweet corn is in season in many states right now, making it one of the best things about August and the dog days of summer. Corn has its origins in the New World—its earliest incarnation was traced to Central Mexico—but it quickly became a staple across Planet Barbecue. (Most cultures refer to it as maize.) And as many grill masters know, there is no better way to cook it than on the grill, preferably over a wood fire. 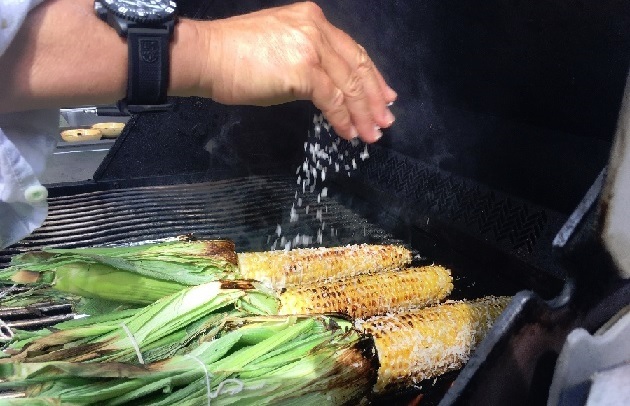 The high, dry heat of the fire caramelizes corn’s plant sugars, making it taste candy sweet with a hint of wood smoke. 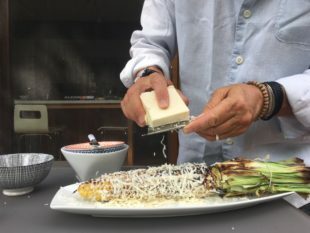 Though I’m a native Iowan and therefore a card-carrying “cornivore,” it wasn’t until Steven’s book BBQ USA (Workman, 2002) was released that I had my personal corn epiphany: “Windy City Corn,” a recipe inspired by Mexican elotes, was a game changer. 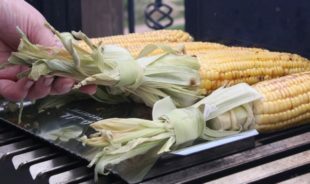 The husks are pulled back and tied off to make a handle, the silk is removed, and the corn is grilled until the kernels pick up some patchy color. Each ear is then slathered in mayonnaise, sprinkled with chili powder, crumbly cotija cheese or grated Parmesan, and lime juice, then finished with fresh chopped cilantro. Corn prepared this way is positively addictive. If your crowd dislikes eating corn right off the cob, you can cut the kernels from the ear and make a kind of elotes salad. (Tip: Lay the corn on a large cutting board and cut off the kernels with lengthwise strokes of a chefs knife.) Or balance the cob on the center of a round angel food or bundt pan and slice downward so the kernels fall into the pan. Happily, you don’t need many tools to grill corn: a sturdy pair of long-handled tongs; a silicone basting brush; grill gloves; and an optional set of corn on the cob holders (yes, time to retire those yellow plastic ones that have been in the kitchen drawer since the Johnson administration). A corn grilling basket, which enables you to turn four ears at once, is also very useful. Coconut-Grilled Corn: Steven discovered this preparation in Cambodia. Warm 3/4 cup of unsweetened coconut milk in a small saucepan. Add 2 tablespoons of light brown sugar or palm sugar and 2 bay leaves or 1 pandanus (screwpine) leaf. Grill the corn over a medium-hot fire for 2 to 3 minutes per side, basting several times with the coconut milk mixture. If desired, you can roll the ears of corn in flaked coconut, then return them to the grill to lightly brown. Trinididian Grilled Corn with Shadon Beni Butter: First published in the Barbecue Bible, you’ll need a special herb called shadon beni or culantro for this recipe. If unavailable, substitute fresh chopped cilantro leaves. 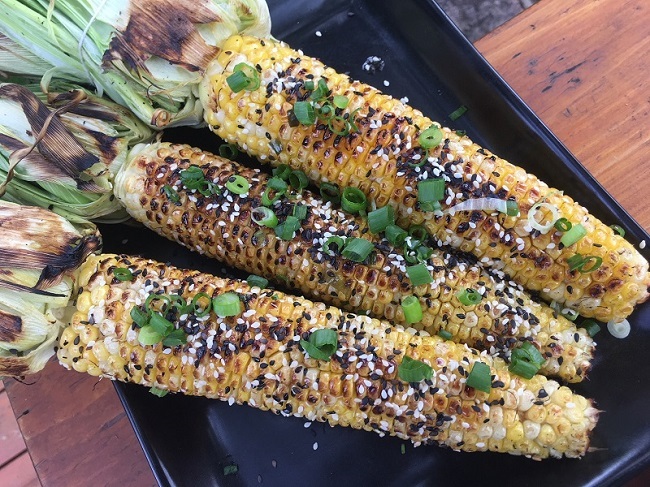 Korean Grilled Corn: A friend who recently lucked into a pop-up restaurant in Aspen sent us a photo of this preparation, which we duplicated by brushing grilled corn with Steven’s Korean Barbecue Sauce. It was topped with crumbled cotija cheese—though you could use feta—and thinly sliced scallions. Superb! Find more globally-inspired recipes here. We also recommend grilling extra ears to use in quesadillas, tacos, Avocado and Corn Salsa, corn bread, enchiladas, grits, and Grilled Corn Pudding. Have any innovative corn ideas? Tell us about them! On Facebook, Instagram, Twitter, or the Barbecue Board.